With several recent updates to our Intranet and Policy Management System, we thought we’d share some of these most notable and exciting features with you. We’re so thankful to our clients for their patience and feedback while we strive to make our software the best it can be. We hope these updates will give you a better idea of the great new features available for your Intranet portal and/or policy management system. We now have more social features to engage your staff. Not only can you comment on content sections, but now you can now Like them too! All Likes are tracked and tallied within the system for quick reporting and review. This is a great way for internal communication staff to determine content relevancy and to gauge engagement. Email notifications will be sent to the content managers when Likes come through too. 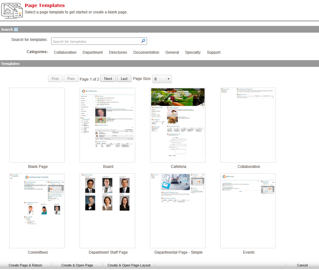 Designing your Intranet just got a whole lot easier. Portal and Page Group Administrators will now have predefined templates at their disposal to use when creating new pages. The templates include a variety of components that correspond to different types of pages (such as the homepage, physician’s page, etc.). However, these templates are not set in stone. Portal and Page Administrators have the creative liberty to add, edit, or remove page components. The new Recycle Bin feature gives your organization an extra layer of backup. Mistakes happen, and if a contact or policies and procedure component get accidentally deleted, don’t fret. Just access the recycle bin from the administration menu. You can choose to delete items permanently or restore if necessary. With our FAQs component, this new feature allows an editor to display multiple questions with expandable and collapsible answers. When a question is clicked on, the answer to the question will expand beneath the question. This is great for IT departments that want to put FAQ’s on their departmental pages or any departmental pages that need to present a knowledgebase. Now authenticated users have the ability to bookmark a list of links to pages and documents that they visit regularly in one component. Now users can easily get notified with useful Intranet usage and viewing metrics via email on set days of the week. 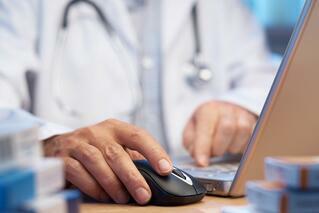 Easily get alerted and updated about your systems page visits, content readership and more! Policy management has had some major updates! 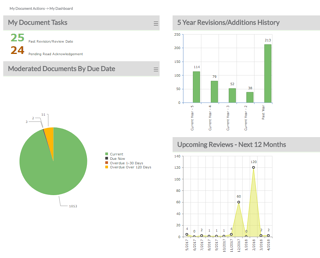 Your P&P management system now offers improved reporting including direct-to-Excel exports, nicely-designed and actionable charts, a simplified management console, more clearly-styled search results, and inline MS Word editing directly on your portal to save you the steps of downloading and re-uploading existing documents that need revision. In the new P&P dashboard, you’re now able to see and access your pending document actions such as read acknowledgment or starting revision drafts, a chart of moderated documents, revision and additions history chart, and plotted graph of reviews coming up over the next 12 months. Simply click on the item in the chart or graph to link to that information. The charts can also be individually added to any page, and more of this visual information will become available over the coming months. This will allow P&P administrators and managers to have highly customized pages detailing the information that is most important to them. 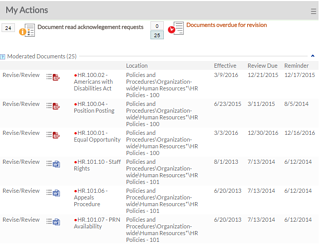 This component displays a list of Policies and Procedures documents that are new or recently revised. Choose from five preset date ranges or list the entire history of added or revised documents. 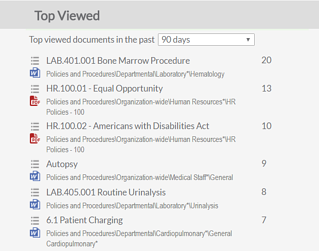 This component displays a list of top viewed Policies and Procedures documents. Choose any timeframe from the past 24 hours to the past 90 days. This is a valuable tool to show which policies are most important or visible to users, as well as a way to identify gaps in content that should be receiving more views, which will allow you to craft an engagement strategy. For information on how HospitalPORTAL Intranet or Policy Management System can help you remain compliant, schedule a demo or request a quote now.